By: Ernest G. Schwiebert Jr. IN THAT GRADUAL AND SATISFYING progress that one makes from the status of tyro to expert, he invariably experiences a subtle transformation from fisherman to angler. This metamorphosis is complete when he has acquired such a fine degree of fishing skill that he realizes how seriously he can deplete his sport. Every trout fisherman goes through essentially the same development, usually under the tutelage of an experienced angler. The initial stage usually is one of fishing the live baits. My father guided me toward the eventual role of fly-fishing, and I started toward that cherished goal with the floating grasshopper on a small meadow brook in Michigan. Two things make the small stream an excellent classroom for the beginner. There is no better place to learn the wariness of trout, and the splashy strike to the grasshopper dapped gently along grassy banks is not unlike the rise to the dry fly. As all beginners should be, I was taught to creep quietly to the chosen pocket, peer cautiously through the grass and leaves, and drop my hopper gently above the fish. The trout were not very large, but they usually responded with a quick splash that was excellent preparation for the fly-fishing I was to begin the following year. 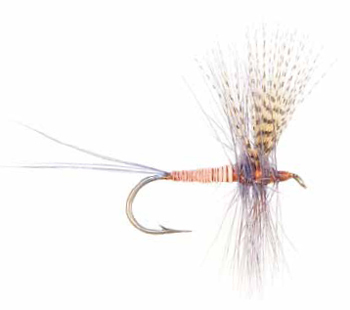 The transition from the hopper to a rather naive but effective dry-fly technique was simple. From this basic foundation I began to dabble in other methods. As my skill increased, I went through that unfortunate stage that seems to afflict us all: the desire to bring in large numbers of fish to prove my prowess. This malady is one that we all contract at one time or another, and some men never seem to overcome its ravages. Three years after my start on that little brook, I met a kind old gentleman on the upper Pere Marquette who smilingly asked of my luck. With the bursting pride of the ten-year-old, I raised the lid of my basket to reveal fifteen trout from eight to eleven inches in length. His kindly expression soured slightly, and he asked why I had killed so many. He added that if everyone were so fortunate, there would soon be no fish left for anyone. Quick rationalization passed his criticism off as jealousy of my catch, but as I look back I see an angler mellowed with years of pleasure on the stream, and I am ashamed. The angler does not need dead trout in his basket to feel satisfaction. He has long since proved to himself that he can catch trout, and needs no proof for his companions. He does not fear the ridicule of others, for he knows that he could fill his limit if he wished. He counts as his highest reward the number of fish put back into the stream for another day. He may bring in fish now and then if someone has expressed a desire for them, but he loves his fishing far too much to spoil it with wanton killing of the trout. Locating a large trout is the greatest thrill for the angler, for here is an adversary worthy of his skill. He may try the fish for hours or even days without success, and still return home satisfied. As my father recently said to me in an armchair session, it is not the hundreds of fish taken that one remembers, but those few heavy trout taken or lost under difficult conditions. Just the knowledge that a big fish is present adds flavor to a pool. Friends once told me the story of a great trout that lived in the pool just above their cabin. Although the stream was not posted, these men improved it unselfishly with low rock dams and private planting. The water bordered by their land became the finest anywhere on the stream, and it was not long before large wild fish began to appear in its pools. One large brown became the favorite, and all of the men had raised him at least once. Several of these men had hooked and lost him, and one had actually landed and released him after finding that he measured twenty-seven inches. The fish was like an old friend. And then an outsider armed with night crawlers and twenty-pound gut took the fish under cover of high water and killed it on the spot. Without the big brown that had lived there, the magic of Cabin Pool was gone. Beginners may ask why one fishes if he is to release his catch. They fail to see that the live trout, sucking in the fly and fighting the rod, is the entire point to our sport. Dead trout are just so much lifeless meat. If food is the reason for trout fishing, then the fish market is a cheaper place to obtain it. We cannot begrudge the local angler his fish, but the man who travels hundreds of miles to the stream is paying five to twenty dollars for each pound of fish. When one stops to consider his motivation in the light of economics, it becomes obvious that he fishes for the sport and not the meat. The question of releasing trout always brings up several arguments against the practice. Most men contend that if they do not kill the fish, somebody else will. This is quite true, but they still have not lost the fun that they had. And catching a trout adds to his shyness, and may well put him beyond the reach of men less skilled than the angler who releases him. Some fishermen will grant this point, and will add that it makes them too hard to catch. This seems to be a viewpoint of laziness rather than reason. LaBranche writes in The Dry Fly and Fast Water that anything that makes the fish harder to catch improves the sport. The final argument left to the skeptic is that the fish die anyway. I have long since proved this false to my own satisfaction. In a two-week experiment on a small ranch pond I caught and released the trout. There were about thirty trout from ten to twenty inches. Each fish gave up a particular part of his dorsal or caudal fin, and the exact nature of this surgery was recorded in a notebook. Each fish had his own page, complete with data regarding his capture. Not one fish died from my handling, and many of them were taken several times each week. The fish were not handled with wet hands, for the danger of squeezing them too tightly with wet hands is greater than the threat of fungus. They were held gently in the water in a natural swimming position until they darted off in their own time. This is the only way to release trout, for the tired fish thrown carelessly back into the water may never recover his equilibrium. In the stream, one should hold them gently with their heads into the current while they recover. Catching and releasing these fish did not impair their energy in any way. They did become increasingly difficult to catch. I have seen men who thought themselves outdoorsmen point with pride to washtubs full of small trout on western rivers where the limit in pounds, if one wished to take it, was possible in three or four fish. In a cursory check of various state laws, I found that the highest resident and nonresident license fees are less than five and eleven dollars. When one stops to consider the fact that it costs from one to two dollars for each pound of trout stocked, he cannot help but see that the license fee does not pay for the propagation of the fish so taken. The fish hog costs us money and cuts down future sport for himself as well as others. Aside from the economic considerations, the problems boil down to pure ethics. As William Michael aptly phrased it in Dry-Fly Trout Fishing, it becomes a matter of “catch your limit or limit your catch.” The latter course is our only choice if we are to leave anything but memories for our children. There are many opinions on just what good trout fishing is. One school of thought may expound the virtues of wilderness water, while another quietly loves the intriguing and difficult sport of fooling a nice fish or two from some intimate “fished-out” stream. The thrill of the home run would be lost if one were hit with each trip to the plate, and so it is with fishing. The most satisfying fishing of all comes on the quiet pools of a familiar stream. This fishing in the shadow of the city is not for the man who needs weight in the creel, but a deep satisfaction comes with even a modicum of success on such water. Farsighted individuals have shown us the way to better fishing, but it is regrettable that many of our streams have deteriorated to the point where posted water has been forced into being. We have no one to blame but ourselves. Some of the private water in our eastern trout country is well worth serious study. The reduction in bag and size limits, and the practice of stream improvements, have greatly improved the fishing. 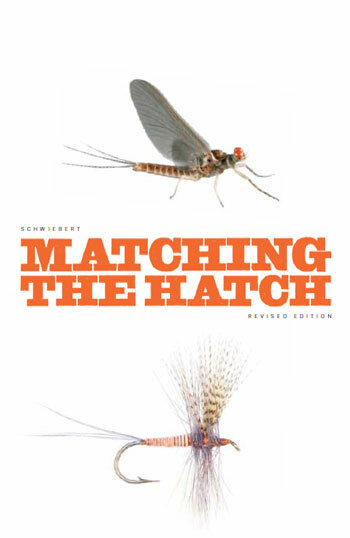 Photograph of Red Quill tied by Eric Austin from the cover of Matching the Hatch Revised Edition. Edward Ringwood Hewitt has shown us how to rejuvenate unproductive water with low dams. His water on the Neversink is well known to trout fishermen. The old maestro has up his sleeve many such tricks, which may be found in his little book Better Trout Streams. In 1954 a log dam about three feet high was placed across a barren shallow flat on the East Branch of the Ausable in New York. On water that was formerly fit for nothing but small fish, there is now some good sport. That same season I took a nice dry-fly brownie from below this dam, and on my last evening I hooked and lost a beautiful fish that slid from beneath the foam to seize my floating Hendrickson. Art Flick expressed some interesting ideas on stream improvement to me one season. He believes that it is useless to plant fish in streams that can no longer support wild fish in good numbers. Many anglers feel that one wild fish is worth several of his liver-fed relatives, and Art seems to think that the rivers could be reclaimed at less expense than is incurred in planting. Some of our eastern streams are in bad shape, and some radical changes are needed. Under our present methods, the fishing gets worse each season. Another excellent step in reclaiming our rivers is the planting of water plants to hold the silt beds. They anchor the bottom and banks in high water and serve as shelter for a myriad of aquatic forms. Weeds also greatly increase the oxygen content of the water and lower its carbon dioxide concentration through photosynthesis, and all this makes for a heavy and healthy trout population. Perhaps the primary reason for the fat, healthy fish of European rivers is the presence of the weeds. Of course the alkalinity of the chalk streams is important too, but the oxygen and fly life created and sheltered by the plants is important. We can learn much from the Europeans about conservation. There, spinning is outlawed on water best suited to the artificial fly. Perhaps on our rivers the easily waded water should be restricted to the fly fisherman. The big, heavy water could be the beat of the spinning man, and the small brushy brooks or big water could be open to bait. Perhaps these things could be done, but the suggestions are usually met with great opposition. “It is not democratic, but serves the needs of the fly-fishing elite.” Yet while these arguments of principle wear on, the fishing deteriorates. New York restricted a few miles of its great mileage of trout water to fly-fishing only, and the uproar was almost deafening. One warden complained to me that he could not enforce the fly-fishing rules because the local magistrates refused to recognize them. Such measures have never been necessary in the past, but they are needed now. Let us hope that it is not yet too late. If we are to continue stocking the streams with quantities of fish, perhaps we should use the European system of closing freshly stocked stretches for a season. By the second year the trout are acclimated and show the wariness of wilder fish. It is certainly no sport to take hatchery fish that have just been released. Closing water does not pay off in quick put-and-take dividends, but its benefits would be felt in later seasons. Many European rivers have stretches that lie fallow in alternate seasons. Then nature is allowed to rebuild itself without fishing pressure. The fallow water recovers quickly and serves as a constant reservoir of trout for the rest of the stream. Many satisfying things are to be found along trout water, and on hard-pressed streams they help to compensate for the lack of fish. These things were viewed as streamside distractions by William Schaldach in the exquisite book Currents and Eddies. It is true that the sensitive angler remembers not only the trout taken or lost, but also the little things along the streams. I can remember distractions like the scores of ducks and geese on a Yellowstone pond, the intense blue of the Wyoming sky on those crisp September mornings, and the doe and fawn that crossed a Boardman riffle at twilight in Michigan. There was the mother bear with cubs that crossed the Madison in Montana, and the memory of a three-pound brown that fell to my dry fly on the Ausable is pleasantly mixed with the whippoorwills on those Adirondack ridges. And a scoreless evening in the Catskills was saved by the balmy pine-scented wind that swept down the valley just at dusk. The subject of etiquette along the stream is difficult, for I hesitate to preach about sins that have been mine in the past. Breaches of courtesy on the stream these days are all too common. The regard for the rights of others is of primary concern, and the inconsiderate fellow who shoulders in when you have taken a fish, wades through the water you are fishing, or proceeds to cast over the fish that you are working, is a thoughtless boor. The real sportsman does not hesitate to dress his share of the trout or to scour the dirty dishes in the sand. He helps the less-experienced angler in any way that he can and does not fear the competition that may result. There is a brotherhood among anglers. Some of my closest friends were met casually along a trout stream many miles from home. There is no caste system on trout water. The fish will rise to the crude fly dapped by the backwoods native as well as to the dainty imported one cast by the wealthy financier. Specific rules in angling etiquette are few, and common courtesy is the basis. It is poor form to enter a stream not far above another if he is fishing in that direction. The skillful angler does not disturb the water much, but the beginner is likely to frighten the fish and put them down for some time. One should realize his own capabilities, and enter the stream at a discreet distance above or below another man. The first man in the river has the right of way, and we must not disturb his fun. Often I have raised a good fish and have retired to the bank to rest him. Resting a pool or run is the same as fishing it in stream etiquette. Approaching anglers should bypass such water, or ask if it is being rested, before fishing. As a matter of tradition the man wading upstream has the right of way, since the man coming down is more likely to spoil the former’s chances. The one wading down should retire from the water and move unobtrusively around him. Often the inconsiderate fisherman will acknowledge the right of way and then wade noisily past or walk along in plain view of the fish. He is certainly not improving his own sport, and he is ruining the fishing of another. I once fished a quiet stream with one of the noisiest waders I have ever known. The river was small and flowed gently though pines and cedars over a sandy bottom. The fish were not large, but it was pleasant work. On a placid willow-and-cedar-shaded run one evening, I was startled by a cowlike sloshing behind me. This gentleman had stepped off a low bank into two feet of water, announcing that he was ready to go because there were no trout in the stream. He waddled up to me with the stride used on Manhattan sidewalks, and the surflike waves that rolled up the quiet run can be easily imagined. The trout did not rise again that evening. Much of the water we fish is bordered by private property, and we should respect it. Cattle can be easily frightened and stampeded by the thoughtless angler, with a resultant loss in weight or chance of injury. One ill-tempered bull can right many wrongs here. Some landowners who allow fishing build gates or stiles for fishermen to cross their fences, but there is always some anarchist who carries wire-cutters or pliers to pull the staples. We can hardly blame the owners of posted land in many instances. The cardinal sin so often committed is the disfiguring of the water or the land along it. The refuse that litters the stream and adjacent campsites is often quite astonishing. I have seen bedsprings, cans, bottles, tires, golf clubs and other junk in trout streams. I once caught a nice brown that came from under a transient toilet seat to take my nymph. The logs and stumps of nature would have been a much more pleasing setting. And there is something sacrilegious about cans and bottles in the Beaverkill, and the heavy truck tire that lies deep in Seven Castles Pool on the Frying Pan. What illness of the mind causes this? Trout fishing at its best is a gentle art, both humbling and satisfying. Many who pursue it never see the subtle side at all, but those who do are never without rich memories and the deep satisfaction that comes with anything well done. In these days of hard-fished waters, ethics and philosophy play an ever increasing role in our enjoyment, and to Father Walton’s measure of hope and patience let us add the spice called charity.